Wiseco leads the performance aftermarket by producing the highest quality forged pistons for domestic automobiles, sport compact and racing applications right here in the USA. Wiseco is unique because we forge all of our own pistons in house, and produce all of our own forge tooling right here in the USA. This allows us to control all aspects of our manufacturing process from raw bar to skirt coating finished parts.In addition, in-house dyno testing gives Wiseco the ability to develop state-of-the-art technology such as new shapes, coatings, and components, and lead the industry through rigorous R&D. Linking all segments of Wiseco’s organization through design, testing, manufacturing, and distribution allows us to fulfill market needs with minimum lead-times.Extreme racing conditions demand the strength and toughness that only forged pistons can offer. Compared to cast pistons, forgings are tougher and more durable, and will stand up to the abuse that high performance motorsport applications require. Most castings are brittle, have no grain structure and tend to fail catastrophically when the material yield strength is exceeded. Forgings have condensed grain that is aligned to the features of the part, which produces higher mechanical properties, and resistance to impact and fatigue. Each forging is designed to optimize the strength-to-weight ratio, and maximize performance. All Wiseco pistons are forged and manufactured in Mentor, Ohio. Wiseco’s detailed skirt shapes and profiles are very specific to each application. Variable cam programming software developed in house allows Wiseco to produce high-performance shapes unique to only Wiseco. The skirt shape (barrel/cam) is one of the most functional areas on the piston, and provides stability and smooth operation in the cylinder bore. Stability is important for proper ring seal, reduced friction, and quiet operation. Each skirt shape is designed for a specific running clearance, based on coefficient of thermal expansion of the piston alloy. Some forging alloys expand more than casting alloys, but each Wiseco piston is designed with the proper installed clearance to produce the most power, least wear, and best seal at running temperature, for each application. Comparing installed clearances on cast vs forged parts is not indicative of the running clearance at temperature. Wiseco engineers have a strong background in all forms of racing applications, and produce the best shapes and designs in the industry. Precision machined ring grooves with proper orifice/accumulator volume feature calculated groove root diameters and axial widths, providing excellent surface finish and flatness, maximum ring seal, and minimized blow-by and oil consumption. 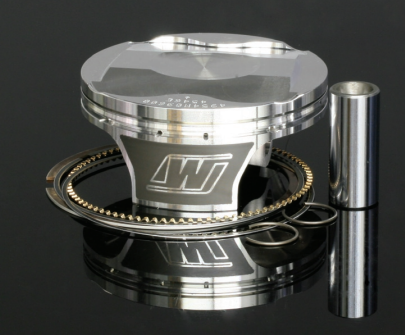 Wiseco engineers specialize in building custom forged pistons to your exact specifications. These pistons are made using the exact same forging process as our shelf stock parts only they are built from the ground up using specifications or example pistons given by the customer. We have been making custom pistons for drag racing, circle track, autocross, road race, rally, and others for decades so you can trust us with a quality build. We pride ourselves in being able to manufacture just about any piston when other companies may so no because it does not fit into their mold of manufacturing. Wiseco’s process is built to handle just about any project you can throw at us. If you would like a custom piston built please reference out customer service page and fill out a custom piston request and we will notify you with a price quote and minimum order quantity. 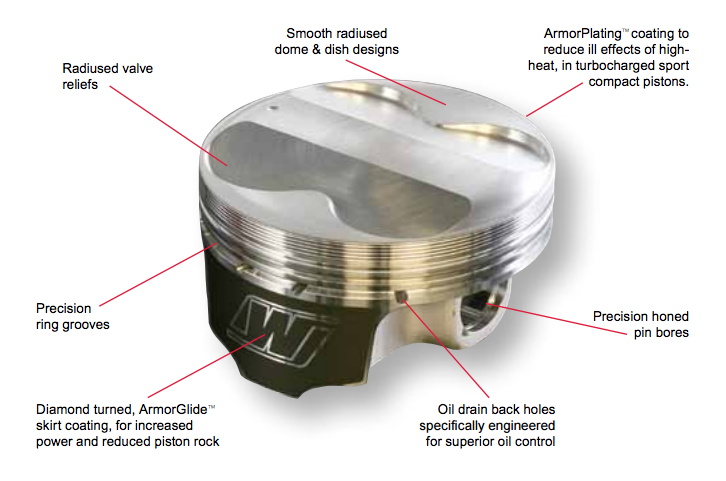 Click here to find more information about the possibilities of making you a custom piston. Click here to take a look at the Wiseco product catalogue. Find more information on the Wiseco website.